Day 3 of winter wheat harvest ended with us finishing our first field down at the Tammany farm. The weight tickets have not been added up yet for us to know what this field yielded, but it was enough to keep 3 semi trucks busy all day. 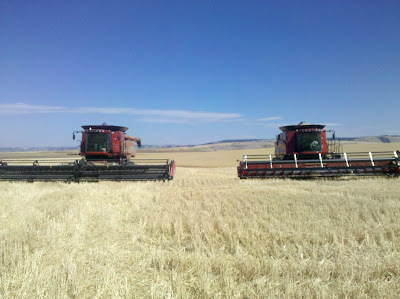 Having enough semi-trucks is important as time is money and it is not efficient or wise to keep a combine lingering in the field waiting to be able to unload the grain. Typically we will have either Farmer Joe or Jay in his combine, then the other farmer will drive one of the other semi trucks, while Cody, our hired man, will drive the other combine. We also will have Kirk, the hired truck driver with his semi truck out in the field as well. The two combines keep Ryan, who drives the grain-cart busy as the combines will unload grain (as shown in yesterday’s video) into the cart, and then Ryan will dump his loaded grain cart into one of the semi trucks. This is one of several fields that we farm and it is 37 miles from our main farm. The climate is warmer and milder by about 10 degrees and thus this area is usually the first to be harvested. As the other Tammany wheat fields are not ready, we had to move the equipment up to another field closer to Genesee. Moving from field to field is like a mini parade of farm equipment (minus the crowds, confetti & candy), 2 combines, 1 tractor pulling a grain cart, 2 or 3 semi trucks plus our pick-ups. The normal driving time from one farm to another is about 1 hour, but when moving equipment at speeds of 15-20 mph, you can easily add another 1 ½ hours to that time. To get to the next field, we will go up a steep gravel canyon road and one of the pick-ups will flag for us to alert other vehicles on the road that we are en route as often times there is no place to pull over and the equipment takes up the entire gravel road. (Next time the farmer promises to have a video clip of this mini parade). The video clip above shows Ryan blowing off the combine before we move out of the field, and as Farmer Joe narrates - 2 things are important: 1) keeping the wheat chaff cleaned off prevents it catching on fire and 2) sanitation purposes so we don't infect other fields with any foreign or unwelcome weed seed. Some of the weeds that are common to the Tammany area are not up in our area and therefore, we do not want to be a "carrier" and contaminate our other fields. As this area is in a lower elevation than where we live, reptiles can sometimes be seen. Ewwwww, as you can tell, I am not a fan of snakes and glad it wasn't me that discovered this little surprise. combine just before we were heading out to move.